As of 2010, there were nearly 14 million Jews around the world. 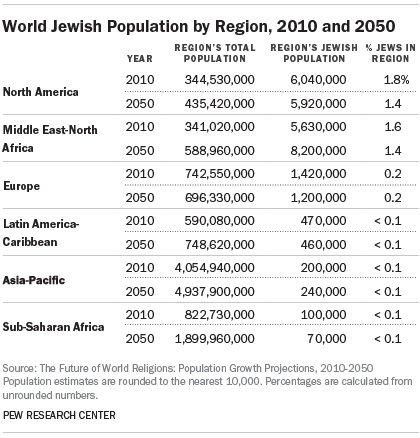 In 2050, the Jewish population is expected to number about 16 million. The share of the world’s population that is Jewish – 0.2% – is expected to remain about the same in 2050 as it was in 2010. Over the next few decades, Israel is projected to pass the United States and become, by a sizable margin, the country with the largest Jewish population. 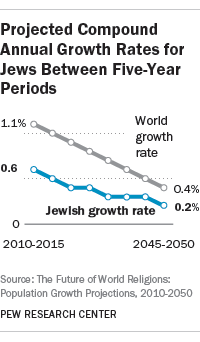 In the decades ahead, the annual growth rate of the Jewish population is expected to remain lower than the growth rate for the general world population. Jews were largely concentrated in North America (44%) and the Middle East-North Africa region (41%) in 2010. Most of the remainder of the global Jewish population was found in Europe (10%) and the Latin America-Caribbean region (3%). In 2050, a majority of the world’s Jews (51%) are expected to live in the Middle East and North Africa (mostly Israel), while more than a third (37%) will live in North America. The share of the global Jewish population living in Europe is projected to decline to less than 8% by 2050. 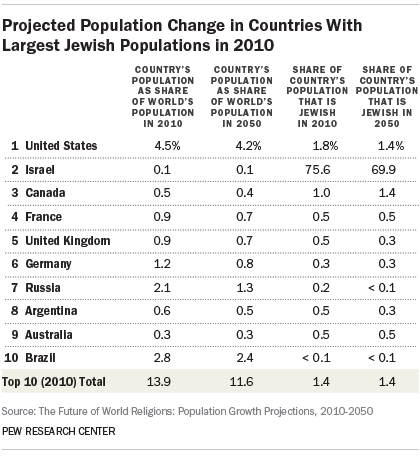 In the coming decades, Jews are not expected to increase as a share of the population in any region of the world. In the Middle East-North Africa region, for example, about 1.6% of the population identified as Jewish in 2010; 1.4% of the region’s 2050 population is expected to be Jewish. Although the Jewish share of the Middle East and North Africa is projected to decline, the absolute number of Jews in the region is expected to rise from 5.6 million in 2010 to about 8.2 million in 2050. In North America, the Jewish population is projected to decline both in total number (from 6 million in 2010 to 5.9 million in 2050) and as a share of the region’s population (from 1.8% in 2010 to 1.4% in 2050). 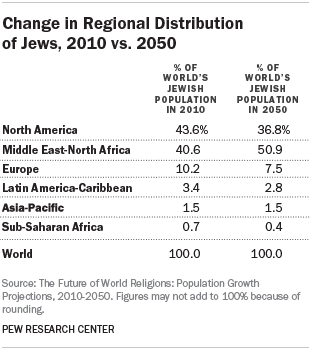 Between 2010 and 2050, the Jewish population is projected to grow in only two regions. The size of the Jewish population is expected to increase 46% in the Middle East-North Africa region, although this is less projected growth than the region’s population as a whole (73%). 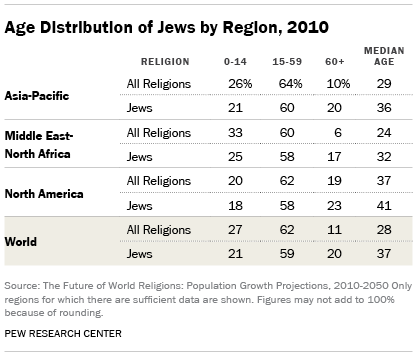 The small number of Jews in the Asia-Pacific region is projected to grow 21%, about on par with the region’s overall growth (22%). 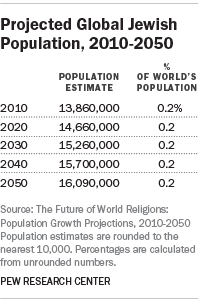 In all other regions, the size of the Jewish population is projected to decrease. For example, the Jewish population in North America is expected to shrink in size (minus 2% growth) while the region’s population as a whole is expected to grow (26%). In Europe, the pace of population decline is expected to be more rapid for Jews (minus 15% growth between 2010 and 2050) than for Europe’s general population (minus 6%). In sub-Saharan Africa, the relatively small Jewish population is projected to shrink from about 100,000 in 2010 to 70,000 in 2050. That minus 29% rate of growth is in stark contrast with sub-Saharan Africa overall, where the population is expected to grow 131% in the coming decades. 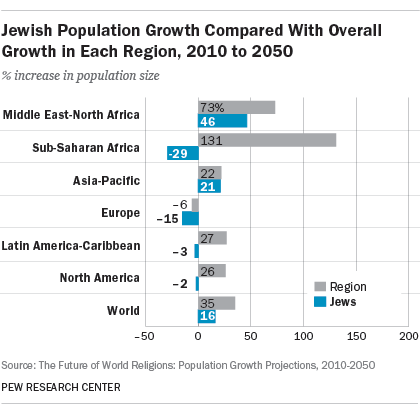 The countries with large Jewish populations in 2010 are expected to experience slower population growth than the rest of the world in future decades. 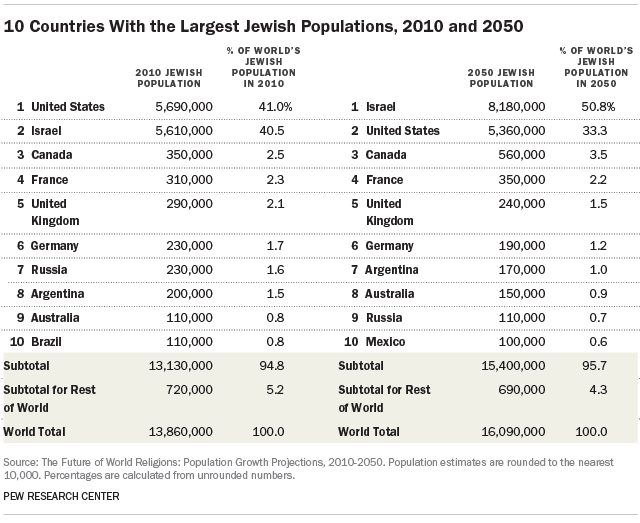 The 10 countries with the largest Jewish populations were home to about 14% of the world’s population in 2010; they are expected to hold less than 12% of the world’s people in 2050. The United States and Israel had similarly sized Jewish populations in 2010 (5.7 million Jews in the U.S., 5.6 million in Israel). Other countries with a considerable number of Jews as of 2010 included Canada (350,000), France (310,000) and the United Kingdom (290,000). Nearly 95% of all Jews in the world lived in the countries with the 10 largest Jewish populations. Only Israel had a majority-Jewish population, with about three-quarters of its population (76%) identifying as Jewish in 2010. In the other nine countries on this list, about 2% or less of each nation’s people were Jewish as of 2010. By 2050, Israel’s Jewish population (8.1 million) is expected to be significantly larger than the U.S. Jewish population (5.4 million). Between 2010 and 2050, Israel’s Jewish population is expected to grow by about 2.5 million people while the U.S. Jewish population declines by about 330,000. As the number of Jews in Israel increases, so will Israel’s share of the world’s Jews. By 2050, more than half of the world’s Jews (51%) are expected to live in Israel. In 2010, about 41% of Jews lived in Israel. Meanwhile, about a third of the world’s Jews (33%) will live in the United States at mid-century, down from 41% in 2010. While the Jewish population in the U.S. shrinks, some other minority religious groups in the U.S. are projected to grow in size, largely due to immigration. As a result, Judaism is no longer expected to be the most common non-Christian religion in the U.S.; people who identify with the Jewish faith are expected to be fewer in number than Muslims in the U.S. by 2050. The Total Fertility Rate (TFR) of Jews from 2010-2015 (2.3 children per woman) is above replacement level (2.1, or the number typically considered necessary to maintain a stable population, all else being equal). It is relatively high in the Middle East and North Africa (2.8) and relatively low in Europe (1.8) and North America (2.0). 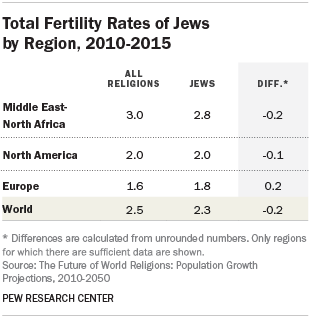 In the Middle East-North Africa region, Jewish fertility is slightly lower than fertility for the regional population overall. In North America, Jews have about the same fertility rate as the general population, while in Europe, Jews have a slightly higher fertility rate than Europeans overall. 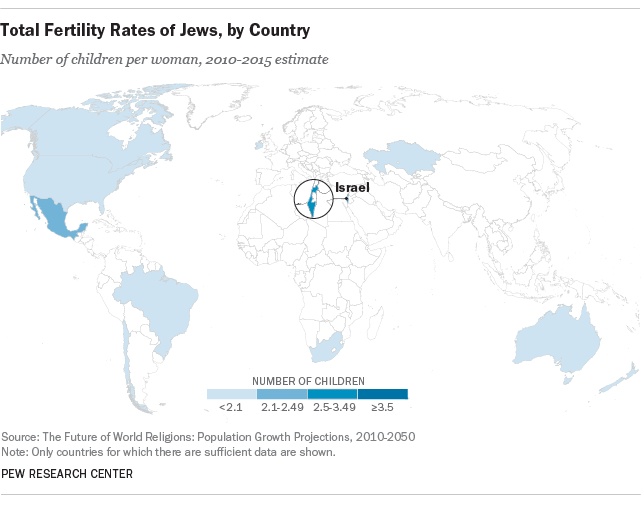 Jewish fertility is highest in Israel, with a Total Fertility Rate of 2.8 in the 2010-2015 period, but it is below replacement level in the United States (1.9). 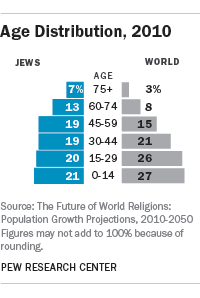 Globally, Jews were considerably older (median age of 37) than the world’s population (median age of 28) as of 2010. Indeed, about four-in-ten Jews (39%) were ages 45 and older, while roughly a quarter (26%) of the world’s people were at least 45. In each region where detailed age information for Jews is available, Jews were older than the regions’ overall populations in 2010. For example, in the Middle East-North Africa region, Jews had an older median age (32) than the regional median (24). North America had the smallest gap between Jews and the population as a whole; North America’s median age was 37 as of 2010, compared with 41 for Jews living in North America. Religious switching was not modeled in Israel, home to 41% of Jews in 2010, because reliable data on patterns of religious switching in Israel were not available. However, data for religious switching among Jews in the United States are available, showing that more people are switching out of Judaism (as a religion) than are switching in.57 With religious switching included in the projection model, the Jewish share of the population in North America is expected to be 1.4% in 2050. In an alternate scenario in which switching is not included, the Jewish share of the region would be slightly higher (1.5%) in 2050. For decades, migration from countries throughout the world has been a major contributor to the growing population of Jews in Israel. Similarly, decades of Jewish migration from Europe to the United States and Canada has been an important factor in the growth of the Jewish population in North America. However, Jewish migration has decreased significantly in recent years, including to Israel and North America. Because the population projections in this report use migration data from the most recent decade as a guide for forecasting the future, migration is not expected to have a large impact on Jewish populations at the regional level in the coming decades, at least compared with its impact during the 20th century. When migration is factored into the projection model, Jews are expected to make up a slightly smaller share of North America’s population (1.4%) than if the projections did not include migration (1.5%). In the Middle East-North Africa region, the projection models with and without migration do not show a sizable difference in the share of the population that is Jewish (about 1.4% in 2050 in either scenario).